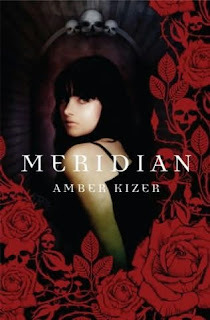 Summary: Sixteen-year-old Meridian has been surrounded by death ever since she can remember. As a child, insects, mice, and salamanders would burrow into her bedclothes and die. At her elementary school, she was blamed for a classmate’s tragic accident. And on her sixteenth birthday, a car crashes in front of her family home—and Meridian’s body explodes in pain. Before she can fully recover, Meridian is told that she’s a danger to her family and hustled off to her great-aunt’s house in Revelation, Colorado. It’s there that she learns that she is a Fenestra—the half-angel, half-human link between the living and the dead. But Meridian and her sworn protector and love, Tens, face great danger from the Aternocti, a band of dark forces who capture vulnerable souls on the brink of death and cause chaos. My Thoughts: I really had no idea what this was about when I first heard of it. Than it got more and more raves all over the blog-sphere so I decided to check it out! Had the hardcover edition! I have a few friends who didn't like it and a few who did so I just had to read it to see what my opinion would be. I did enjoy it and finished it within a few days. We meet Meridian (what a cool name) and I instantly liked her personality. She is a little bit confused on the whole idea that she could be a Fenestra. But she accepts it pretty rationally. She doesn't jump up and down mad that she has to leave her family, she is pretty mature about it. She goes off to live with her Great Aunt's house. We learn about Tens (not the first time I've heard this name) and his back-story along with the Aternocti's story. The chapters quietly unfold theirselfs and we learn why it is happening to her and why she is thrown into the middle of it. I liked the whole concept of the window. Won't give too many spoilers away. Was very interesting! Overall: I liked it and finished it within a few days. A lot of people seem to want this book so I'm sure it will continue to circulate the blogs! If you get the chance to read it, please do. This is one of those books I actually took the dustjacket off to read because I didn't want to ruin it. Overall, quick fun read. Cover: I think the cover is cute! I also like the colors, they just seem to go together if that makes sense. Especially the flowers on the front! Glad you liked it! It's next in my pile, right after I finish Blood Promise. Guess this is the first time I read a summary for this book. I like the cover, not sure about the plot, it sounds so...morbid.LOL, I know half death thing. Maybe I'll put this on my library list. I loved this book too. I wasn't expecting to but I really did. I can't wait to read more about Ten.